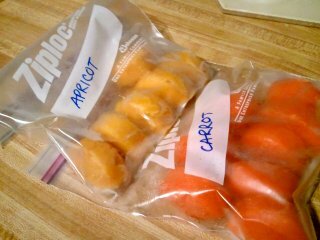 Late, late, late, that’s what my CSA posts are. Home cooking has become even more of an adventure now that the kid is scooting around on the linoleum, tripping me up while I’m wandering around the kitchen holding hot items or knives or other dangerous things. As a bonus, he has learned to pry open the kitchen cupboards and grab an onion or a towel before the door closes on his hand (or head!). I keep meaning to get those child-safe door-blocker thingies. Someday soon. 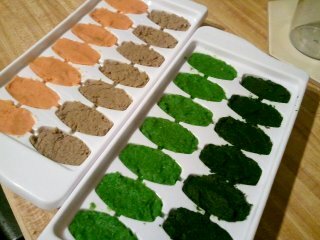 Anyway, I need to squeeze this post in before we get the CSA pickup again tomorrow. I really love visiting the farm this time of year; the weather is wonderful. Three whole weeks ago! 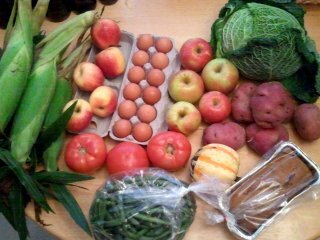 was CSA week 17, consisting of corn, Savoy cabbage (this actually sat in the fridge, perfectly crisp, until I cooked it up this past weekend), red potatoes, green beans, tomatoes, Gala and Jonagold apples, an acorn squash, eggs, and bread (Great Harvest pecan pumpkin, mmm). And then! 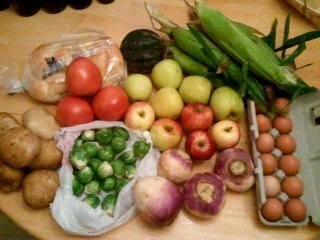 Two weeks ago, CSA week 18, bringing us more corn (I think this was the season’s last corn), more tomatoes, another acorn squash, Granny Smith and Gala apples, turnips, Brussels sprouts, white potatoes, eggs, and bread (Great Harvest challah). We cooked the corn and squash on the grill, baked the turnips with some carrots, baked the Brussels sprouts with garlic, and stashed the potatoes for later. 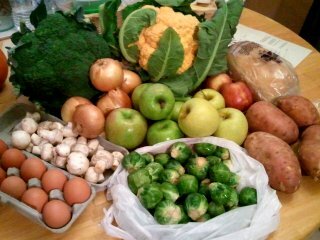 Finally, last week, CSA week 19: Lovely large heads of broccoli and cheddar cauliflower (cheddar indicates the color, not the flavor), onions, mushrooms, Granny Smith, Red Delicious, and Golden Delicious apples, sweet potatoes, even more Brussels sprouts (don’t worry, I love Brussels sprouts), eggs, and bread (Great Harvest white). When I take home the share, all the apples go straight into the bottom fridge drawer; they can keep for weeks at a time. The kid is running out of applesauce, though, so I’m hoping to make some more tonight; as a bonus, it’ll clear out the apple space for the inevitable apple onslaught. The last few weeks of the CSA are always very apple-heavy — which is not a bad thing, at all.